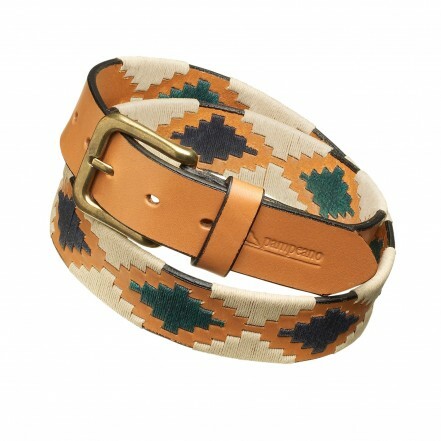 One of Pampeano&apos;s most popular designs with a very strong link to its heritage and origin, this polo belt blends the colours of the Argentine estancia and boasts both workmanship and culture. With a rich London Tan&apos; leather base, complementing cream threads have been hand stitched through the edges of the buttery Argentine leather to create the iconic Argentine pampa pattern. Navy and green threads create alternating diamonds through the centre of the polo belt to achieve a truly eye catching design. A nickel free buckle with an antique finish further complements the design and our pampeano logo is subtly stamped into the finished piece. The polo belts at pampeano are made of the highest quality vegetable tanned Argentine leather and will only get better with age. They are all hand stitched with such precision and care you will feel they each have their own story to tell. Just like its name sake, the Estancia is strong and something the owner will be proud of. Used for cattle rearing, sheep shearing, horseback herding and of course, playing polo, estancias are steeped in tradition, encompassing the past with the grand European houses and fostering the future with the cultivation and current use of the land.